You are currently browsing the CycleStreets blog archives for October, 2009. If you have not already voted, and you want to support CycleStreets, please vote today to get CycleStreets some much-needed funding! Thank you to the very many people who have told us they’ve voted for us. Your votes are much appreciated! Also, check out our recently-added features page! Simon, lead developer for CycleStreets, has reached the shortlist for the East Anglian section of the TalkTalk Digital Heroes Digital Heroes awards! If won, this would be worth £5,000 of much-needed funding for CycleStreets, an OpenStreetMap-based project. Please vote for Simon as our ‘Digital Hero’ if you like CycleStreets, and help us get CycleStreets some funding! If you know others who have used CycleStreets, please do ask them to vote too ( – but obviously please do not spam). In terms of funding more generally, we can now accept donations, which will help in particular for server costs. If you have any suggestions for grant-funding bodies to which we could apply, we would also be interested to know – do drop us a line. Thanks to everyone who has given any help with CycleStreets – and indeed OpenStreetMap – so far. CycleStreets Ltd includes a not-for-profit clause in our governing documents. Until now the ‘quietness’ of the suggested routes has been a fairly discrete percentage score. The overall quietness of a route depends on how much of the journey is spent on the different types of road. The quietest paths, such as dedicated cycleways score 100%, and busy roads 50% or less. We hope this makes it clearer in helping decide how suitable the suggested route might be for you to ride. We’ve added a new features page that describes most of the existing functionality of CycleStreets. We’ll add new stuff to it as the system improves. We’ll probably also add a few tiles on the actual routing engine features – some new aspects of which are being worked on right now. At long last, we can now accept donations! Donations will help us develop new features, pay for new server equipment to increase the speed of the system, and to improve functionality by paying for non-Free data sources (e.g. the Postcode Address File – see blog posting to follow). In a month or so we’ll be needing to pay for our server hosting costs, so donations will be useful. We’ve been applying for various small grants to help with this (and are in the running for a funding award – if we get enough votes!) We’re working up to apply for some larger grants also and working on our Local Authority strategy in terms of longer-term sustainability. A key issue in the longer term for the system will be keeping up improvements to the quality of the routing quality, as well as getting the speed up. This means spending a lot of time on the algorithms, and money on server equipment, as well as making sure we are well-embedded in the cycling community so that we can get feedback – a crucial resource. As cyclists, we know about the sometimes complex choices that are made on the ground about what direction to take in a cycle route. Details like path widths, traffic issues, surface quality, hills, etc. are all things we are working to factor into the system so that the system mirrors as much as possible the human-decision making processes that go into route choice. Clearly this is complex, hence why CycleStreets doesn’t always get it right (yet!). We even now take account (where the data exists in OpenStreetMap) of the number of steps on a bridge in the case of areas where a walkable short-cut exists! Donations will give us both financial and moral support so that we can make CycleStreets the leading cycle route-planning service in the UK. CycleStreets is run on a not-for-profit basis: our company documentation lodged with Companies House when we set up the company in July includes a not-for-profit clause. Posted in Funding | Comments Off on CycleStreets: donations welcome! A WEBSITE based in Cambridge which plans cycle routes anywhere in the country has been shortlisted for a regional award. CycleStreets was created earlier this year by two cycle-campaigning web developers in Cambridge, building on the success of an earlier system for the city which had planned almost 50,000 journeys. Cyclists can visit www.cyclestreets.net and get options for both the quietest and fastest routes suitable for a range of cycling abilities. The system is run as a not-for-profit venture. It is in line for a prize in the TalkTalk Digital Heroes Awards which celebrates the work of people who use digital technology to bring about positive social change. Members of the public can vote online to select the winner. 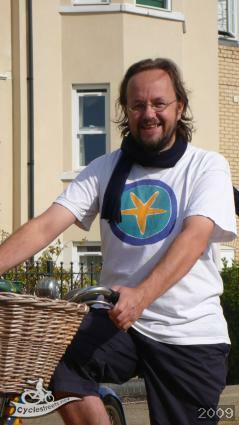 Simon Nuttall, creator and lead developer of CycleStreets, is in the shortlist of three people for the East Anglian region. He said: “Winning the Digital Heroes award for East Anglia would be a great boost after years of complex technical work on the system. Vote at http://www.talktalk.co.uk/we-love-the-web/digital-heroes/east-anglia/ or click on the red Digital Hero button at www.cyclestreets.net.